Ford Fiesta Interior, Sat Nav, Dashboard | What Car? You sit higher up than in many rivals. This isn’t necessarily a bad thing, but some may prefer a lower-slung posture. Active models have a ride height that's 18mm higher, but it only makes a subtle difference. 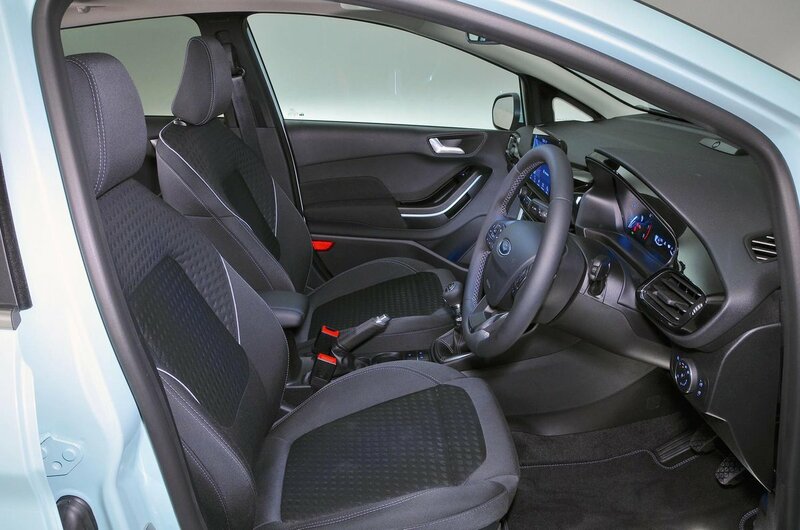 Height aside, the Fiesta’s driving position is tough to knock; the seat holds you securely in place through corners while remaining comfortable on long distances. Go for ST-Line X trim or higher and you even get adjustable lumbar support – a rare but important feature in this class. Happily, it’s a cheap option on Style and Zetec models. Meanwhile, the controls for the air conditioning (which becomes automatic climate control when you upgrade to ST-Line X trim) are logical and clearly marked, although the cruise control buttons on the steering wheel are a bit fiddly. 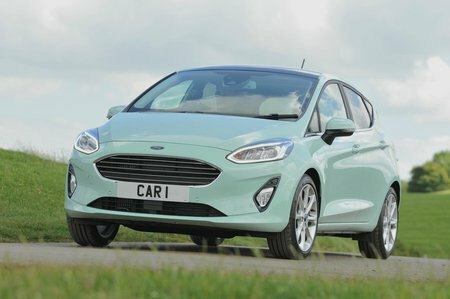 The Fiesta’s rounded shape does compromise visibility slightly, with relatively small rear side windows hampering your over-the-shoulder view. Mind you, the high driving position gives a good view of the road ahead and your view out of junctions isn’t too restricted. A heated windscreen that can de-ice frost in moments is a major boon in winter and is standard on all trims apart from entry-level Style. Rear parking sensors are standard on Vignale and Active X trims and a reasonably priced option on others, while a reversing camera is fitted to Titanium X and Vignale cars (optional on everything but Style). The 8.0in touchscreen infotainment system – with sat-nav on Titanium models and above – is bright and relatively simple to use, but isn’t quite as intuitive or quick to respond as the one in the Seat Ibiza or VW Polo. Our main complaint is that there are no physical shortcut buttons to make it easier to hop between functions. Zetec and ST-Line trims make do with a 6.5in touchscreen that doesn’t have built-in sat-nav, but upgrading to the larger screen won’t break the bank. Meanwhile, all trims apart from entry-level Style have Apple CarPlay and Android Auto, allowing you to tether your phone and control selected apps through the car’s touchscreen, including navigation. Base Style trim gets a titchy 4.2in screen, Bluetooth and a basic AM/FM radio. Although you do get a smartphone dock as well, we’d upgrade to Zetec. The upgraded Bang & Olufsen sound system is seriously punchy, if a little flat in the mid-range. It's still well worth considering if you love music, though, and comes as standard on B&O editions and selected other upper trims. For those who still use CDs, a glovebox-mounted CD player is optional on all Fiestas. 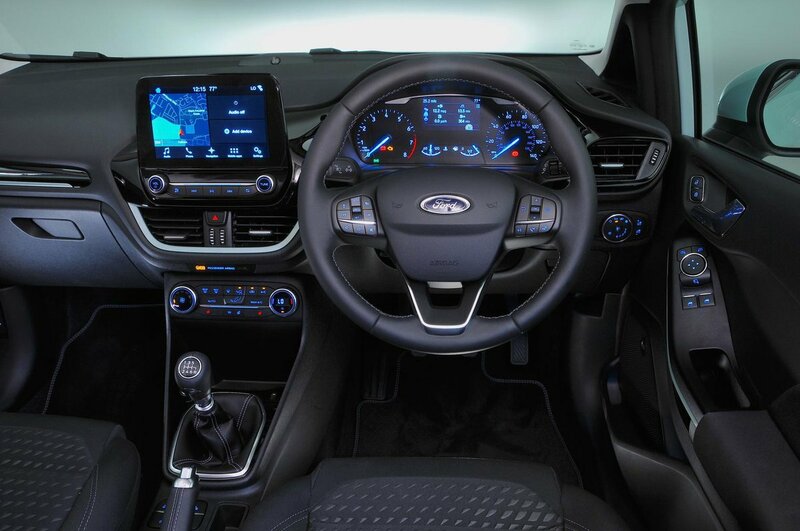 The interior bits you touch regularly – the steering wheel, gearknob and indicator stalks – feel fairly upmarket by the standards of the class, and the Fiesta even has soft-touch plastic on parts of its dashboard. You won’t find any of that in the Ibiza or Skoda Fabia. Mind you, the Fiesta’s interior doesn’t feel quite as solidly screwed together as the Ibiza’s or Polo's. You’ll also notice some unappealingly textured plastics lower down on the Fiesta’s dashboard.